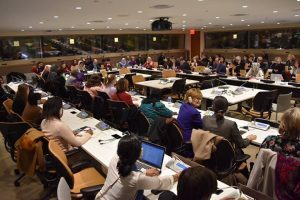 New York, 17 March 2018 – On Monday, 12 March 2018, the United Nations celebrated the opening of the 62nd Session of the Commission on the Status of Women (CSW). 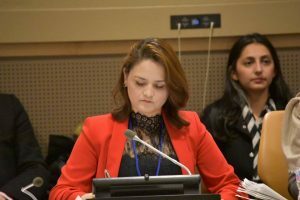 Representatives of Member States, UN entities, and non-governmental organizations (NGOs) from all regions of the world came to New York to attend the session. The priority theme for this year is “Challenges and opportunities in achieving gender equality and the empowerment of rural women and girls”. On this important occasion, a delegation headed by H.E. 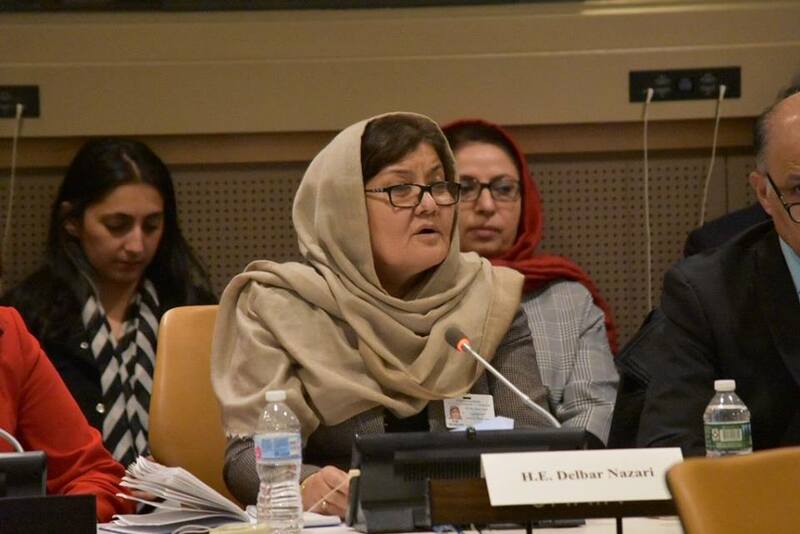 Delbar Nazari, Minister of Women’s Affairs of the Islamic Republic of Afghanistan, was in New York to participate in the session and engage meaningfully with the international community, present Afghanistan’s achievements and challenges, and share best practices and lessons learned. 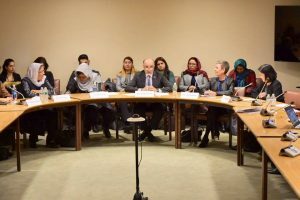 On Wednesday, 14 March, the Permanent Mission of Afghanistan organized a side event on the theme “Women, Peace, and Security: Challenges and Achievements”. 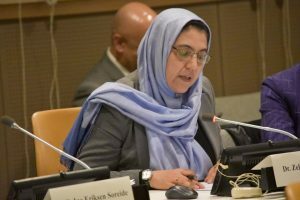 This event constituted a precious occasion to present and discuss Afghanistan’s efforts in the implementation of the first ever National Action Plan (NAP) on UN Security Council Resolution 1325 (on Women, Peace, and Security) and its linkages with the Government’s efforts in the implementation of the 2030 Agenda for Sustainable Development, to ensure the achievement of gender equality and women’s empowerment. Panelists included Minister Nazari, Ms Habiba Sarabi, Deputy Chairperson of Afghanistan’s High Peace Council, H.E. 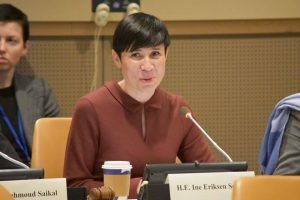 Anne Meskanen, Ambassador-at-Large for Global Women Issues and Gender Equality at the Ministry of Foreign Affairs of Finland, as well as, Dr. Miwa Kato, Regional Director of UN Women Regional Office for Asia and the Pacific. During the same day, Minister Nazari delivered Afghanistan’s statement at the general debate segment of the session. In the speech, she highlighted the critical importance of women as powerful agents of change and spoke about the need to empowering rural women to uplift Afghan society. In this regard, Ms. Nazari presented Afghanistan’s National Priority Program on Women Economic Empowerment as a fundamental policy tool to provide women with educational programs to increase, among other aspects, their active participation in the economy. 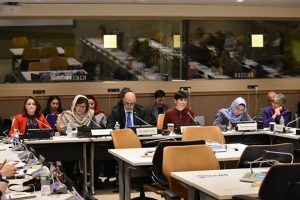 On Thursday, 15 March, the Permanent Mission of Afghanistan organized a second side event on the theme “Afghan Government Initiatives and Measures for the Improvement of Rural Women’s Situation”. 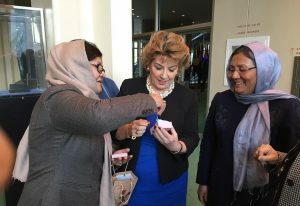 The event began with a video message from the First Lady of Afghanistan. 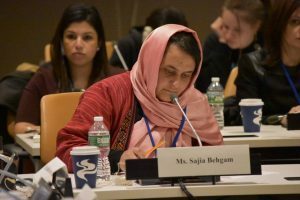 The event among other key issues, focused on achievements and challenges of women and girls in Afghanistan with regards to education, political participation, and economic self-sufficiency. 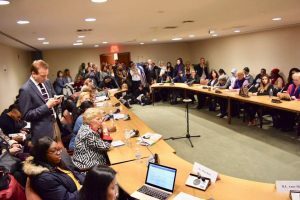 The discussion revolved around four main areas of work of the Government: refugees and internally displaced people, women’s contribution to agriculture and economy, women’s access to education, and women’s access to health care services. Panelists included Minister Nazari, H.E. Ine Eriksen Soreide, Minister of Foreign Affairs of Norway, Ms. Sajia Behgam, Senior Advisor to the Chief Executive of Afghanistan on Women and Youth Affairs, Ms. Najiba Nooristani, Head of the Gender Unit at the Ministry of Education of Afghanistan, and Dr. Zelaikhwa Anwari, Director of Reproductive Health at the Ministry of Public Health of Afghanistan. Both side events were moderated by H.E. Mahmoud Saikal, Ambassador and Permanent Representative of Afghanistan to the United Nations and witnessed wide and constructive participation from Member States and civil society representatives. 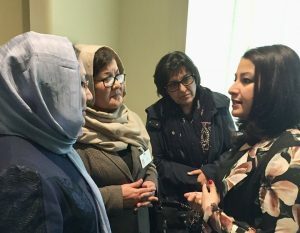 In addition to her participation to side events and the plenary sessions, Minister Nazari took part in bilateral meetings with the Honourable Maryam Monsef, Minister of Status of Women of Canada, H.E. Fatma Betül Sayan, Minister of Family and Social Policies of Turkey, and H.E. Dr. Shezra Mansab Ali Khan, Member of the National Assembly of Pakistan. 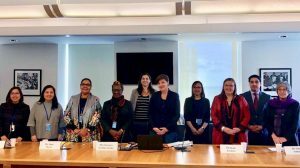 On Friday, 16 March, the Permanent Mission of Afghanistan to the UN co-hosted another CSW side event on how National Human Rights Institutions can advance gender equality and the rights of women and girls in rural areas. 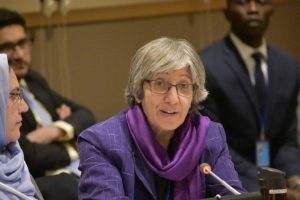 Afghanistan’s Chair of Independent Human Rights Commission Dr Sima Samar was a panelist and Deputy Permanent Representative Nazifullah Salarzai participated in the discussion. 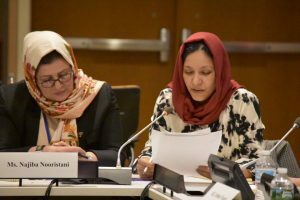 The 62nd Session of the Commission on the Status of Women was a moment of great importance for Afghanistan’s engagement on the world stage. The visit of the Afghan delegation, under the leadership of H.E. Nazari, was conducive to exchanging views, sharing lessons learned, and ways to tackle common challenges not only with other Member States, but also with the UN system and representatives of the civil society. 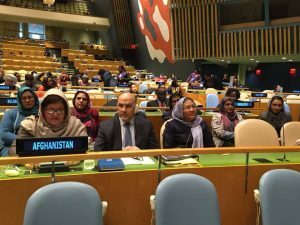 Afghanistan’s engagement on an issue of vital importance for the country – women’s rights and their empowerment- was a testimony of the Government’s commitment to achieve full gender equality and ensure a prosperous future for the women and girls of Afghanistan.